One .9 quart will cover approximately 30-50 square feet (one coat). A polymer modified emulsion designed to seal oil and gasoline stains prior to applying JETCOAT Driveway Sealers or Resurfacers. Dries clear. CLEAN OIL SPOTS- Scrub oil and grease stains with stiff brush or broom, household detergent, and water. Rinse thoroughly with water. APPLYING OIL SPOT PRIMER- Mix contents of container by moderate shaking. 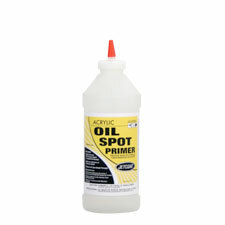 Apply oil spot primer to stained areas. Spread with paint brush or other suitable brush. A second coat of oil spot primer may be applied for added bleed-through resistance. Oil Spot Primer must be completely dry before applying driveway sealer. 23744 .9 qt. Bottle 2.33 lbs.